As the new year has begun, I was thinking that I should add more diversity to my blog so here it is! 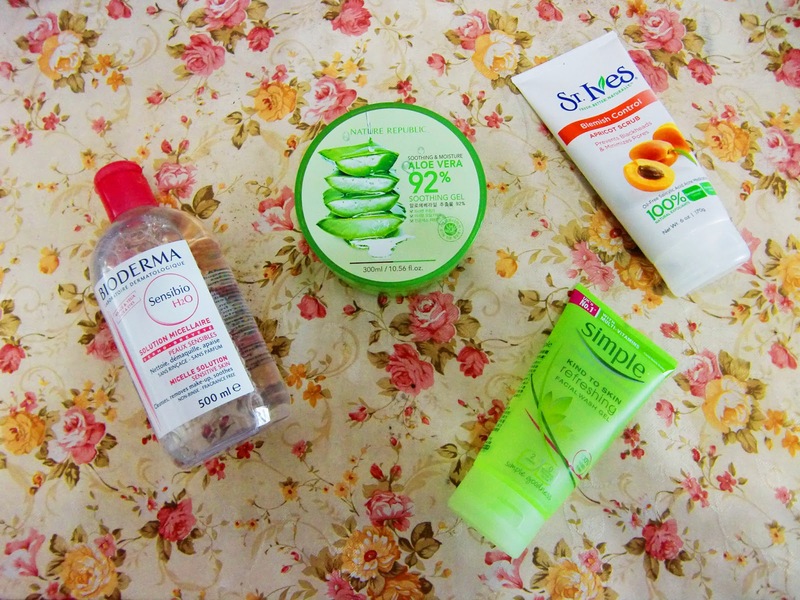 I'm going to share my skincare routine with you! :) But here's a disclaimer, I'm no beauty experts or specialists, I'm just trying to share with you what I use and like for my skin. 1.Bioderma Sensible H2O - I recently started using this product and it really works wonders on your skin! It can be used to cleanse or remove makeup from your face and eyes and it does clear the impurities on your skin such as blackheads and get rid of the makeup very easily. 2.Simple Refreshing Facial Wash Gel - As a girl who lives in a busy city where cars are everywhere, I get blackheads quite easily and this facial wash really keeps my skin thoroughly cleansed but doesn't make it dry which is kinda perfect. What's better than a fresh face right? 3.St. Ives Blemish Control Apricot Scrub - I know some people say (including my mum) scrub is bad for your face because it will maximize your pores and make your skin rough but I really heard a lot of good things about this scrub before I reached my hands on it and it doesn't disappoint me! It really prevents blackheads and minimize my pores as it says on the packaging which is quite awesome. But of course, you cannot use it everyday otherwise it may be too irritating for your skin. 4.Nature Republic Aloe Vera Soothing Gel - Again, I had heard many good stuff about it so one day I just decided to try it out. For its very cheap price (HKD$28 which is about USD$3.6), it really does a job in mosturizing your skin and it won't make you feel oily or anything which suits me perfectly!